Sammy the Bearkat, the mascot of Sam Houston State University, went to Las Vegas looking for some recognition and returned to Huntsville with the top prize at the United Spirit Association's national competition. The competition consisted of a prepared skit, and Sammy took on mascots from schools like Oregon, UCLA and Washington State. This was also the first time Sammy has ever won a competition and his first time at the USA competition. The theme of the skit, with Patrick Gardenier inside the suit, was a road trip, and the two-minute performance showed Sammy encountering the many things that can happen on a trek. It starts off when Sammy wrecks his motorcycle in a small town, and features music from the Village People, M.C. Hammer and Rick James. Besides the eclectic musical numbers, Gardenier said the wide variety of props he used was the key for Sammy's first-place finish. Those items included a stand-up of the Village People and a motorcycle. "I think that was the thing that really separated our skit from everybody else's was the props," Gardenier said. "With everybody else, there wasn't a whole lot with what they did." This is Gardenier's fifth year inside the Sammy costume. He originally came to SHSU to study criminal justice, but after earning his degree, decided to go to graduate school to learn history. "For me, I gradually got more and more into it," Gardenier said. "When I came to Sam, I came for criminal justice and I wanted to get done as quickly as I could and go get a job. But then I found myself finding ways to stick around." At first, Gardenier was not involved with anything at school. In fact, he had never been to an SHSU football game before donning the Bearkat costume. He first found out about the possibility of becoming a mascot at SHSU's block party. Mascot tryouts were announced and Gardenier thought it would be fun to see what he could do. "I figured I wasn't going to make it, but I tried out anyways," Gardenier said. "I go and tryout, and I make it and then they came to me and said 'Do you want to do a football game tonight?' And I've been doing it since then." While at games, Sammy is involved in a wide variety of activities. 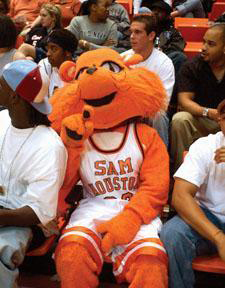 Whether he appears with the players or fans, the mascot can almost always be seen somewhere when SHSU sports are played. "Sammy always runs out with the football team," Gardenier said. "Sammy will go out in the crowd, but most of the time, he just stays down on the track. He likes to go over to the couch potatoes, because that's where a lot of the louder fans are." Since the job is such an active one, not only does Gardenier sweat, but he sweats inside a big suit, which makes matters even worse. "It's hot. Really, really hot," Gardenier said. "Wherever the performance area is for the mascot, it's about 40 degrees hotter in the suit. Even at Washington for the playoff game and Montana, eventually it starts getting pretty hot." When it gets especially hot, Gardenier said things can be done to make life a little more comfortable. Although he is the official "Sammy," there are others who will take over for a short period of time to give him a rest. "It's really bad on those games where it's 2 in the afternoon during the autumn games," he said. "Every once in a while, if people pay attention, they might see Sammy go over to the trainers and just have them squirt water down his mouth. It goes all over the place, but some of it is going to go in my mouth." It may get tough at times, but the job does have its perks, like competitive trips to Las Vegas, and even some TV time. While in Las Vegas, Sammy made an appearance for a show on MTVU, which is MTV's college-oriented network. He was involved in a "Dating Game" show that involved a cheerleader and two other mascots, and the mascots each went on a "date" with the cheerleader. Sammy's date was a helicopter ride over Vegas. "Sammy has never been in a helicopter before, so that was a lot of fun," Gardenier said. Sammy the Bearkat fans will have a chance to see his award-winning performance Saturday night during halftime at the SHSU men's basketball game.